Integrin Peptide Inhibition: A Potential Treatment Option for AMD in the Future? Allegro Ophthalmics (San Juan Capistrano, CA) is actively developing an integrin peptide antagonist (Luminate, previously known as ALG-1001) for the treatment of DME, wet AMD, diabetic retinopathy (DR), and vitreomacular traction (VMT). Inhibiting α5β1 has been shown to inhibit endothelial cell proliferation by multiple pathways. In addition, inhibiting α3β1 can induce posterior vitreous detachment (PVD).3,4 Figure 1 details how this works. Integrins regulate cell functions, interactions among cells, and interactions between cells and the extracellular matrix (ECM). As they bind or attach to the ECM, integrins activate intracellular signaling pathways and proteolytic changes that promote angiogenesis. 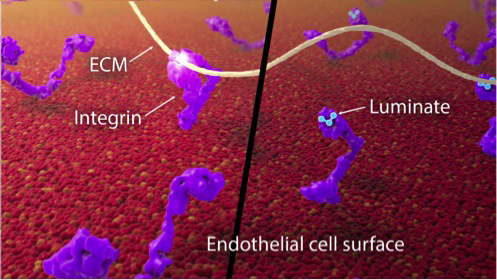 Luminate inhibits the connection between the integrins (shown here in purple) and the ECM, preventing the downstream angiogenic effects. In contrast, anti-VEGF agents do not necessarily treat the underlying neovascularization associated with AMD and DR — instead, they temporarily halt vascular permeability. The second mechanism of action of Luminate — vitreolysis — makes it a promising candidate for treatment of VMT and for induction of PVD in eyes with nonproliferative DR. Early studies5 have shown that Luminate has comparable potency to anti-VEGF therapy as a monotherapy, and may have an added effect when used in conjunction with anti-VEGF agents. In studies of Luminate to date, efficacy lasting 3 months or longer has been observed. Although only early study data have been released, this duration of effect is promising. In a phase 1 safety study in patients with DME, eight of the 15 patients had at least a 3-line gain in best-corrected visual acuity (BCVA) by day 90; four patients gained at least 5 lines. The mean peak BCVA improvement was 11 letters at 2 months off treatment. The mean baseline central macular thickness (CMT) measured by optical coherence tomography was 519 microns, which decreased to 387 microns by 3 months off treatment. Luminate recently entered phase 2 clinical trial testing; patients with DME were randomized to one of five treatment groups that include three Luminate groups (1.0 mg, 2.0 mg, or 3.0 mg), a bevacizumab group, and a focal laser photocoagulation group. The planned enrollment is 150 patients, all of whom will be followed monthly for 6 months. The study started in October 2014, and patient enrollment is ongoing. Interim results from a phase 1b/2a study of patients with neovascular AMD show similar outcomes to those observed in the DME study — eight subjects received 2.0 mg Luminate, seven received 3.2 mg, and seven received 5.0 mg. Patients in the 3.2 mg group averaged a gain in BCVA of 4.2 letters by day 180 (120 days off treatment) and demonstrated a concomitant reduction in CMT. Patients in the 2.0 mg group showed a fairly consistent decrease in CMT, but BCVA gains did not correlate. In phase 1 animal model studies, binding of Luminate to the α3β1 integrin receptor led to the release of cellular adhesion between the vitreous and the retina. In the aforementioned phase 1 study of DME, six of 11 eyes with no PVD or partial PVD at baseline developed total PVD by day 90. Luminate is now in a phase 2 study of eyes with VMT. An additional study to evaluate this drug in patients with nonproliferative DR is expected to begin in mid-2015. 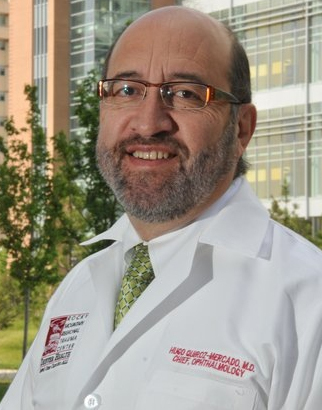 Hugo Quiroz-Mercado, MD, is a consultant for Allegro Ophthalmic, LLC. He can be reached via email at hugo.quiroz-mercado@dhha.org. Reference(s): 1. Friedlander M, Theesfeld CL, Sugita M, et al. Involvement of integrins alpha v beta 3 and alpha v beta 5 in ocular neovascular diseases. Proc Natl Acad Sci. 1996;93(18):9764-9769. 2. Umeda N, Kachi S, Akiyama, et al. Suppression and regression of choroidal neovascularization by systemic administration of an α5β1integrin antagonist. Mol Pharmacol. 2006;69:1820-1828. 3. Ramakrishnan V, Bhaskar V, Law DA, et al. Preclinical evaluation of an anti-alpha5beta1 integrin antibody as a novel anti-angiogenic agent. J Exp Ther Oncol. 2006;5(4):273-286. 4. Oliveira LB, Meyer CH, Kumar J, et al. RGD peptide-assisted vitrectomy to facilitate induction of a posterior vitreous detachment: a new principle in pharmacological vitreolysis. Curr Eye Res. 2002;25(6):333-340. 5. Data on file, Allegro Ophthalmics.